For males, who aim at increasing muscle mass and strength gains, if you only train once a day, 2 g a kg should be more than enough (for women 1.2g /kg of bodyweight). Let’s do the math here. Suppose someone is 75 kg (about 165 lbs). At 2g/kg that would be 150 grams of protein per day. If they eat 5 meals a day that would be 30 grams of protein per meal. The problem is that they will probably not ever reach the Leucine threshold at any of the meals (Protein Gurus – Part 2). As a result they will never maximize muscle protein synthesis. Also the timing between protein meals should be 5 hours and that would be 25 hours of eating in a day. Doesn’t quite fit. 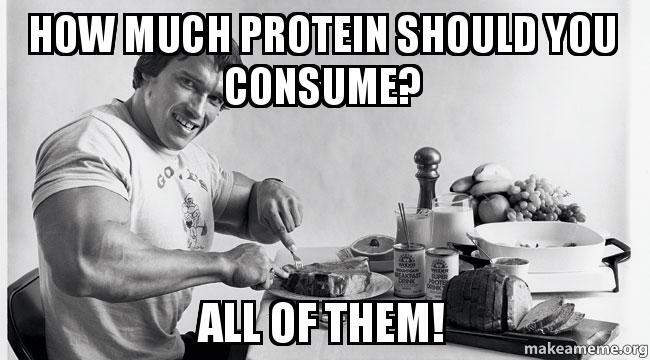 My current optimized method is three protein meals a day spread out by five hours (Muscle Protein Synthesis Meal Spacing Maximum). This can be challenging and does require advance planning for meals. I think that the Alpert number may not be right if you are on a Low Carbohydrate diet. The Alpert number is the maximum rate of fat oxidation from a relatively moderately active person (Hypophagia – How much fat can I lose in a day?). It occurred to me that I can check this number from my own VO2max test. Looking at the REE at rest (REE from VO2max) it shows 2.16 kCal/min. From my Bod Pod results (Overshot My Recomp Goals – Part 1) my fat mass is 12.3 lbs. Multiplying my fat mass times the Alpert number is 381.3 kCals/day. That’s 15.88 kCal/hr or 0.26 kCal/min. Yet, my REE was 2.1 kCal/min at and RER of 0.73 (90% fat) which is 1.9 kCal/min from fat oxidation. Flipping the number around that’s 1.9 times 60 times 24 = 2736 kCal per day from fat. The smallest number I saw in the resting period was 1.209 kCal/min or 1740 kCal/day. dividing 1740 number by my fat weight in lbs is 141 kCal per lb of fat mass. That’s quite a bit more than the Alpert number. The Minnesota Starvation (Ancel Keys) data was the basis of the Alpert number. Perhaps the difference is in the idea that I am not actually in starvation? And the Minnesota Starvation subjects were fed carbohydrates in their diet. The Alpert number pretty closely matches my own experiences in Protein Sparing dieting. Here is another cross-over study showing the advantage of the keto diet over a medium carbohydrate diet (Johnstone AM, Horgan GW, Murison SD, Bremner DM, Lobley GE. Effects of a high-protein ketogenic diet on hunger, appetite, and weight loss in obese men feeding ad libitum. Am J Clin Nutr. 2008 Jan;87(1):44-55.). These men were allowed to eat as much as they wanted but chose to eat less when they were given Low Carb food. Am I Keto or Low Carb? So I am not keto by this gentleman’s definition since my protein is twice his listed amount and my fat is much lower. My protein number is twice his and my fat number is lower than his. And that is nutritional ketosis with a “high” protein intake. 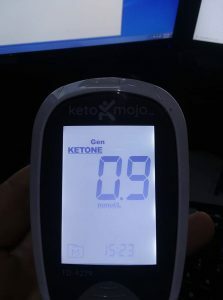 Author DougPosted on July 28, 2018 Categories Low Carb DietTags Ketones, proteinLeave a comment on Am I Keto or Low Carb? 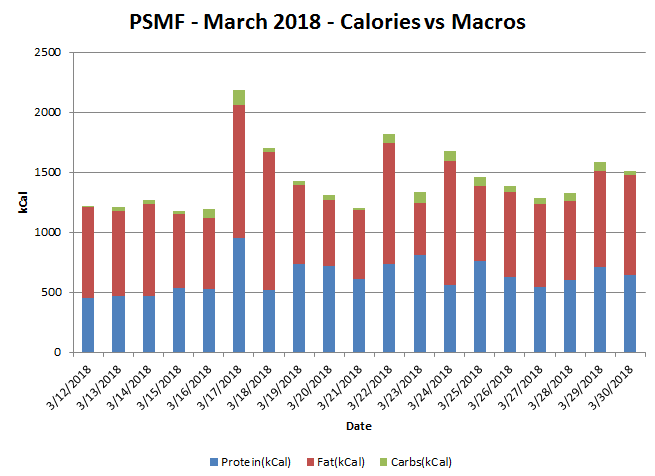 I did a short Protein Sparing Modified Fast (PSMF) back in March (PSMF March 2018). This is a summary of the results. At this limit you will use 1063 calories from your body fat per day. A while back, I noticed that my Blood Sugar peaks around the second day of extended fasting. George Cahill did the seminal work measuring blood markers during starvation (Cahill, George. Fuel Metabolism in Starvation.). 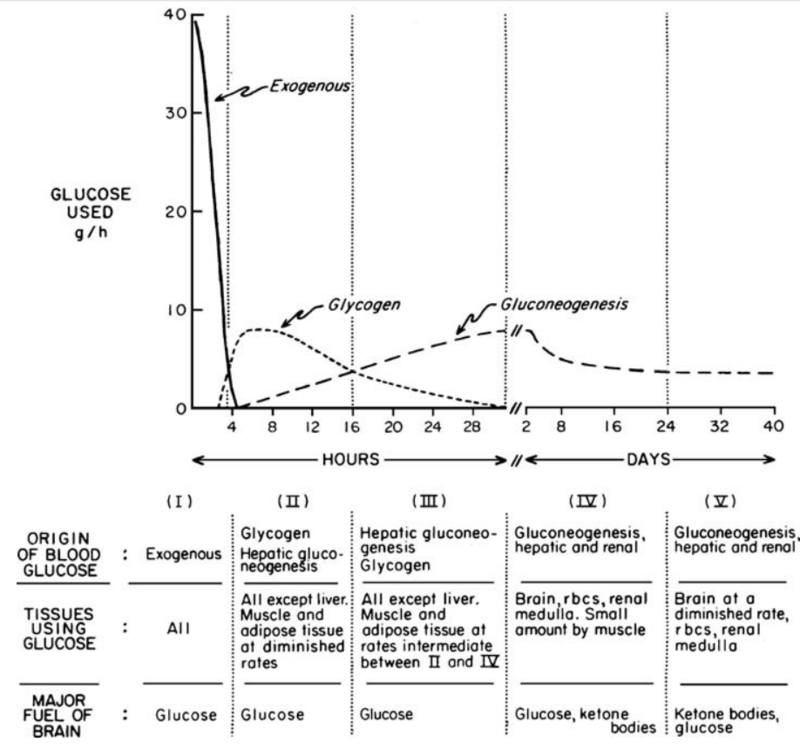 Here’s an interesting chart from that study that explains the sources of glucose during starvation. 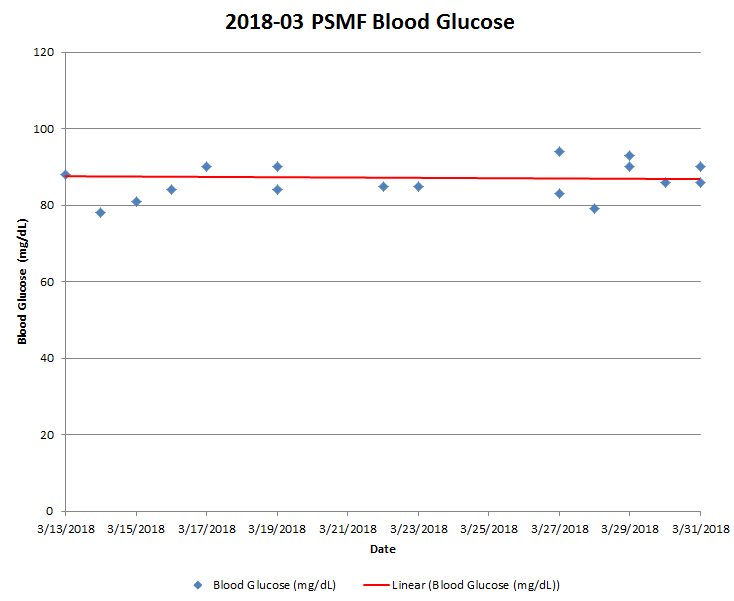 This demonstrates the increase in blood sugar around day 2-3. Diabetics are particularly adept at GNG. Eventually though, even that reduces as the body becomes physiologically Insulin Resistant. The chart can provide some idea of what happens in a ketogenic diet. Although someone on a ketogenic diet is eating enough food, their exogenous glucose is greatly reduced due to the low carbohydrate content of the diet. Glycogen stores lower next. When the glycogen stores get low the body then upregulates Glyconeogenesis (GNG). This could also explain why when I see an increase in blood sugars on one morning I often see a drop in weight the following morning. The body is signalling that it is switching fuel to up-regulated GNG due to dropped Glycogen stores. Although these two sources are of the same magnitude in Cahill’s chart above they could well be less equally matched in a diabetic. It is possible that GNG in a diabetic outpaces the ability to pull from Glycogen stores. 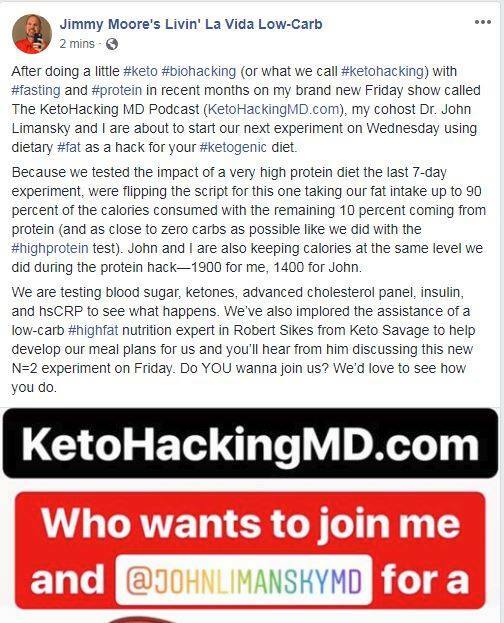 I’ve spent too much time covering the keto hucksters (OK, mostly just Jimmy Moore but he’s a big enough target) so I thought I’d switch it up and look at one of the good guys – Dr. Benjamin Bikman (our YouTube playlist of Dr Bikman). I mentioned Ben in (Great BLOGs). 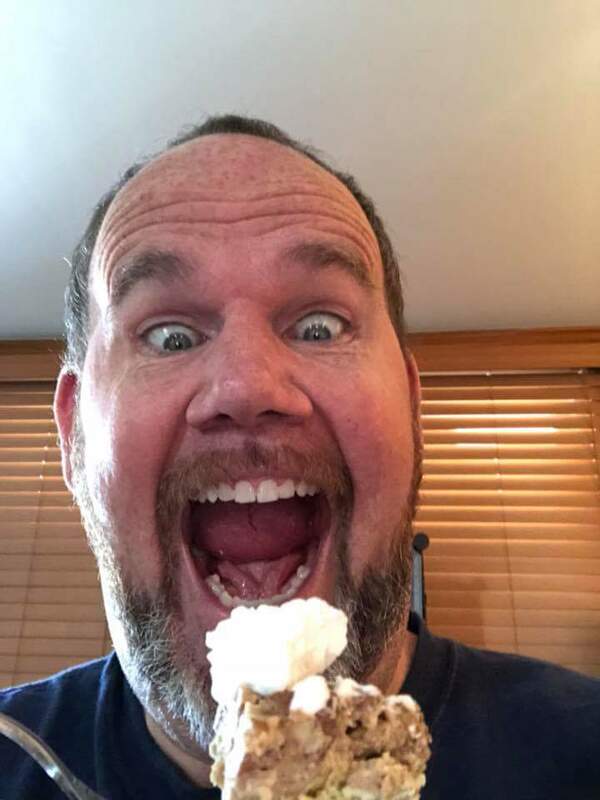 He is a PhD who teaches at BYU and he’s got a lot to say about Protein over at his InsulinIQ site. Here’s a video (High Intensity Health Episode 200) where he is interviewed. Ben is one of the folks who came to nutrition from the exercise side. Ben really gets it about Insulin and obesity. A video on Insulin and Glucagon. Jimmy Moore has been covered here a couple of times (Fat Jimmy and Jimmy Does PSMF – Sorta). Now Jimmy is going to do an experiment to show the effect of eating 90% of his calories from fat. This is designed to contrast with Jimmy’s “failed” protein experiment. Remember that? It was the experiment which dropped Jimmy’s fasting Insulin in half but Jimmy considered it a failure. Jimmy is going to eat 1900 calories for a week. Let me make a radical set of predictions (actually not radical at all). Jimmy weighs north of 300 lbs so he must be taking in like 3500 calories a day. Dropping his calories to 1900 will create a deficit of around 1600 calories a day which should come from body fat. Jimmy should lose about 3-4 lbs of fat over the week. If Jimmy loses more 3-4 lbs that will be interesting since it will create a real mystery as to what he is eating prior to the diet since he would have to be at a large surplus prior to the experiment. Certainly Jimmy has enough fat on his body to support a long fast so this high fat diet will just supplement his body fat stores. Jimmy will proclaim fat the winner over protein. Jimmy is doing 1900 calories with 190 calories from protein or 47.5 grams of protein a day. If Jimmy currently weighs 300 lbs, that’s 136 kg. Jimmy will be taking in 0.35 g per kg of body weight. The DRI (Dietary Reference Intake) is 0.8 grams of protein per kilogram of body weight so Jimmy will be under half the DRI for protein. Jimmy’s cholesterol will go up since he’s going hypocaloric (See Dave Feldman). Jimmy’s diet will be fat bombs. 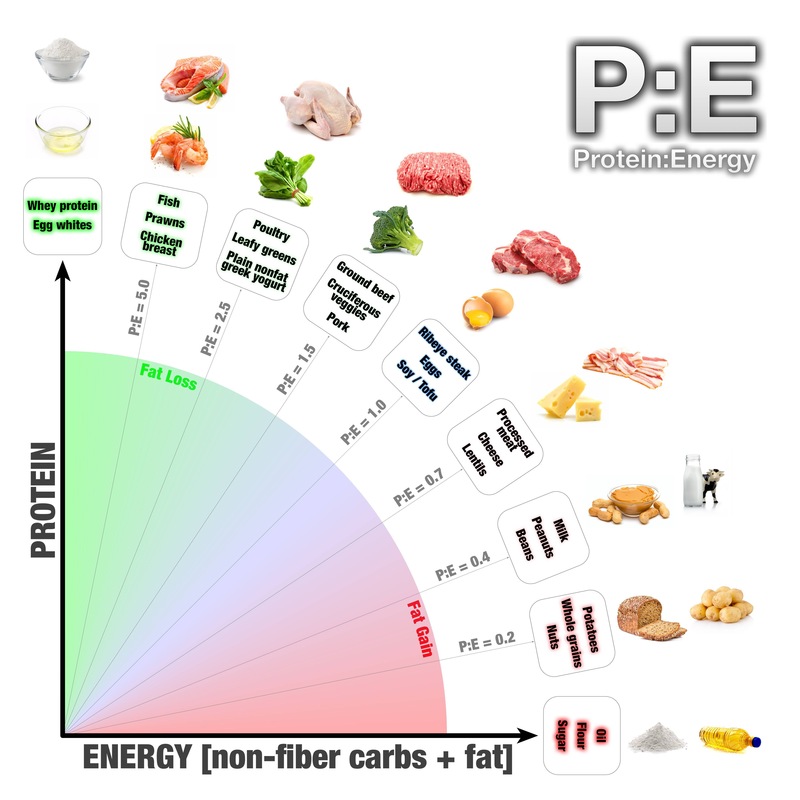 Ted Ted Naiman’s graphic shows the ratio of protein to non-protein energy in grams. To maintain eat as many grams of fat as protein. To lose eat more protein and less fat. To gain weight eat less protein and more fat. Jimmy has been in that diet as he has gotten fatter. Jimmy would do better to listen to Arnold. In my last post I looked at the question of whether eating protein one day causes weight gain the next day (“Protein Makes Me Gain Weight The Next Day”). Turned out protein didn’t make me gain weight all the way up to past 1 grams per pound of body weight. This post looks at the maintenance macros I got from Ted Naiman’s website as described here (Maintenance Macros – Dr Ted Naiman). 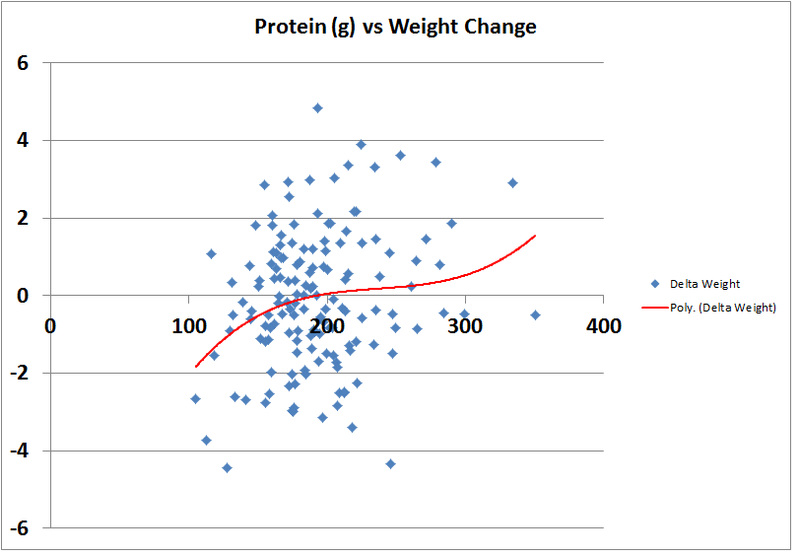 I have 150 days of Cronometer data and looked at the Protein to Non-Protein Energy ratio vs day-to-day weight gain. Ted’s method sets the grams of protein starts to your body weight in lbs. Use the same number of grams of non-protein (carbs and fat) to maintain your weight. For me, that’s 170g of protein, 150g of fat, and 20g of carbs. 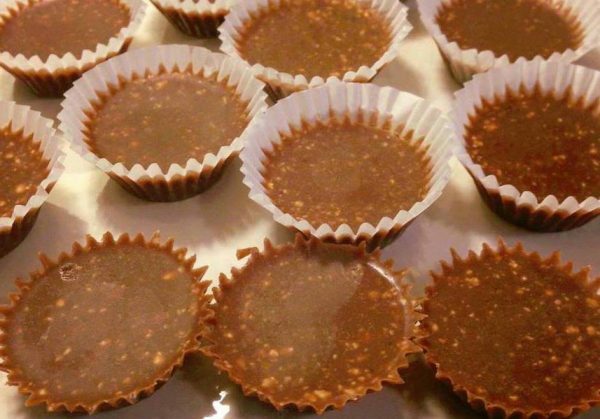 With this method there’s no need to convert the number of grams to calories. 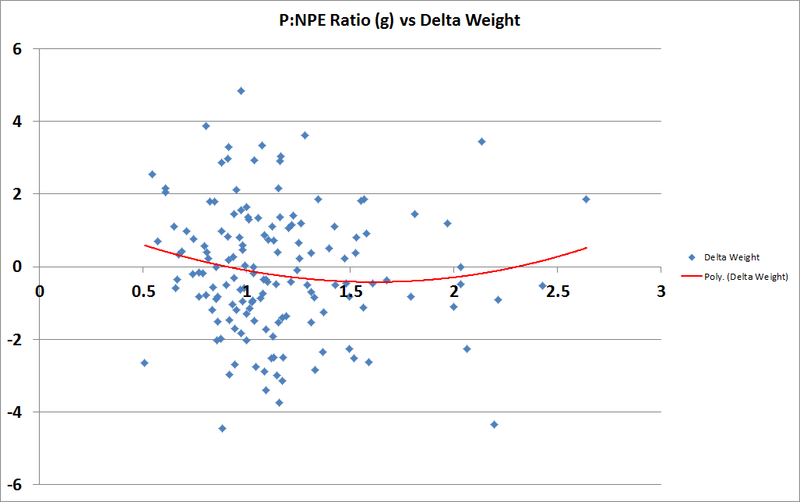 What does my own data show for Protein to non-protein ratio vs day-to-day ratio? The vertical axis is weight change day-to-day. The zero line means that I did not change weight the next day. The day-to-day variance is pretty big. The horizontal axis is the ratio of Protein to Non-Protein grams. Most of my numbers were 1.0 or greater since I was trying to cut weight most of the time. That means I had more grams of protein than grams of fat+carbs. This graph looks at trendlines to generalize out the large day-to-day variances. The trendline is a 3rd order polynomial. There are only a couple of data points above a ratio of 2.0 to base the swing up after 2.25 on. It may not be a real swing. The best ratio for me to have the most loss the next day is around 1.75 grams of protein to grams of fat+carbs. Since I tend to hit my body weight or more in protein that would mean that I am eating relatively low fat on those days. There is a near zero crossing around 0.8:1 (which is more fat than protein). Ted’s numbers indicate the zero cross is around 1:1 which isn’t too far off from my numbers. Below the 0.8 I have a tendency to increase in weight. Ted’s numbers for maintenance are pretty close to my actual measurements. 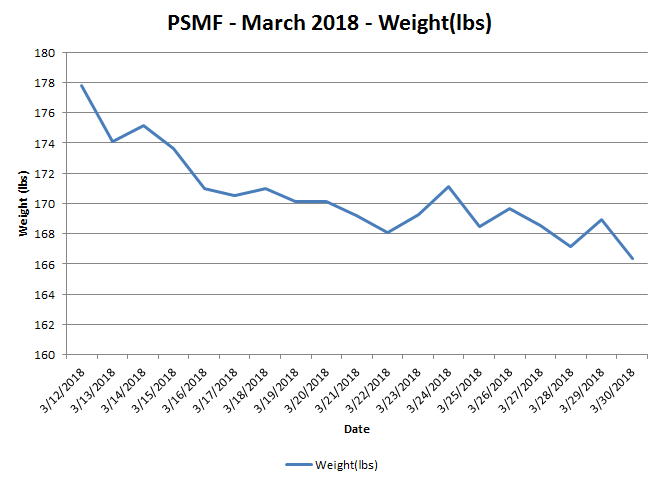 I may have to eat a bit more fat to get to my goals of maintenance – which fits my experiences in the past month or so. [This post replaces an earlier post which had an error in the spreadsheet data]. I rarely see anyone dig deeper into the question of whether higher consumption of protein actually causes greater weight gain the next day spread across time. A single day doesn’t say much about the effect of protein on weight. I have the last 150 days of data from Cronometer so I looked at how much my weight goes up the day after I eat protein. This is a chart of protein consumption compared to weight change on the following day. The diagram is a scatter diagram. The Y axis is weight change between two adjacent days. Day to day weight fluctuations are all over the place. The X axis is grams of protein eaten the day before the weight change. The data is all over the place. The data appears to increase somewhat. More protein should on some level correspond to more weight gain (or less weight loss) since it’s more calories. The red line is the trendline that EXCEL determined. The deviation from the trendline is really big. The trendline shows that under 190 grams of protein (a whole lot of protein) results in weight loss (on the average). My weight is currently around 167 lbs. About 190 grams of protein results in weight stability (a bit over 1 gram of protein per lb of my weight). More protein than 190 grams results in a very small weight increases all the way to over 30 grams of protein. Very low protein (less than 100 grams) results in the most weight lost. It is not clear what the nature of this loss is from this chart. Is it more lean body mass lost? Is it just the low calorie amount for the day? I don’t have any very low protein data since I think it’s a serious mistake to undereat protein. Protein, up more than 1 gram per lb of body weight did not result in average day-to-day weight gain. Your mileage may vary. I am not sure how it could vary by much, but it may.